These cupcake toppers may be used for personal, non-commercial purposes only. They may not be distributed or published elsewhere. 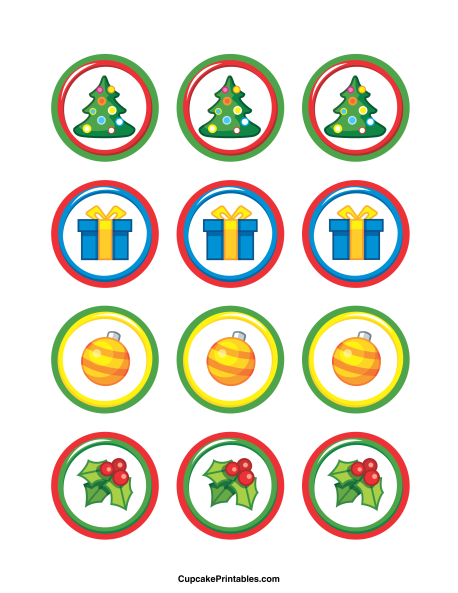 Colorful borders with Christmas-themed graphics in the center of the toppers. The graphics include Christmas trees, presents, and holly and ivy. These 2-inch circles can be used as cupcake toppers, party favor tags, and more. Follow Muse's board Cupcake Toppers at CupcakePrintables.com on Pinterest.